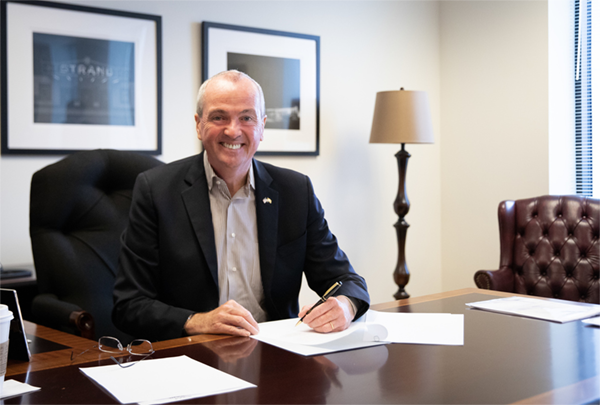 (TRENTON) –Governor Phil Murphy today signed an Executive Order establishing the New Jersey State Capital Partnership, an initiative designed to harness state support and resources to spur economic development in Trenton and help chart a new course for New Jersey’s capital city. The partnership will be facilitated by the Department of the Treasury and will bring together the Department of Community Affairs (DCA), the Department of Environmental Protection (DEP), the Department of Transportation (DOT), NJ Transit, the Economic Development Authority (EDA), the Department of Law and Public Safety (LPS), and other appropriate state agencies, to establish a framework for aligning state resources with the City of Trenton’s plans for development. During its heyday, Trenton boasted a robust industrial economy due to its unique location along the Delaware River between the thriving urban centers of New York and Philadelphia. Over time, domestic and global competition, coupled with suburban flight, took a toll on its economy. Today, more than half of all jobs in the city – roughly 16,000 – are filled by state employees. The State of New Jersey also owns more than $1 billion in property, well over one-third of all tax-exempt property in the city. Utilizing the arts, culture and historical assets to attract visitors to downtown Trenton. "I think this executive order goes a long way toward forging a true partnership between the Capital City and the State," said Mayor W. Reed Gusciora. "In the past, one side or the other may have been striving for this collaborative approach, but rarely have two administrations been on the same page as much as myself and Governor Murphy. I applaud his proactive measures to quickly reestablish Trenton as the prime example of New Jersey's government working for the people it serves." “Today’s announcement by Governor Murphy to make smart investments in the City of Trenton will go a long way toward improving the daily life of residents and visitors. Most importantly, the Governor’s commitment to our capital city and his collaboration with Mayor Gusciora will result in more jobs, better transportation, safer streets and cleaner neighborhoods. I want to thank Governor Murphy for his partnership. We know that only when Trenton thrives can Mercer County fully flourish,” said Mercer County Executive M. Hughes. “I commend Governor Murphy for his commitment to investing in the City of Trenton, and his follow-through in the creation of the New Jersey State Capital Partnership. Economic development opens doors in the communities it touches, and Trenton has long deserved to see those benefits. Today’s Executive Order sets up opportunities for growth that will reenergize our capital,” said Rep. Bonnie Watson Coleman. “This is great news for the capital city. There is so much unrealized potential here and I am thrilled that Gov. Murphy is committed to providing the resources to help Trenton rebound. It feels like the city has been on the cusp of a revitalization for years. Now that we have a committed partner in the governor’s office who understands the role that the state should play in the revitalization of its capital city, we can finally get over that hump. I look forward to working with Gov. Murphy, Mayor Gusciora and all government entities involved in this partnership to help make Trenton’s long-awaited rebirth a reality,” said Assemblywoman Verlina Reynolds-Jackson (D-Mercer, Hunterdon). “I want to thank the Governor for keeping his word and fulfilling the promise he ran on to revitalize our urban communities. The Executive Order signed today will help propel Trenton to its destiny,” said Rev. Dr. Lester W. Taylor Jr.
“On behalf of the members of Shiloh Baptist Church and the residents of Trenton, I applaud the Governor for his foresight and commitment to our capital city. We believe that as Trenton goes, so to goes the State of New Jersey. The Governor’s investment in our capital city will pay rich dividends for future generations to come,” said Rev. Dr. Darrell Larue Armstrong, Shiloh Baptist Church. “The people of Trenton have endured far too much for far too long. This is long overdue. This news is not only encouraging, but will be transformational for the people of Trenton, not only now, but for years to come. Thank you, Governor,” said John E. Harmon, African American Chamber of Commerce of New Jersey.